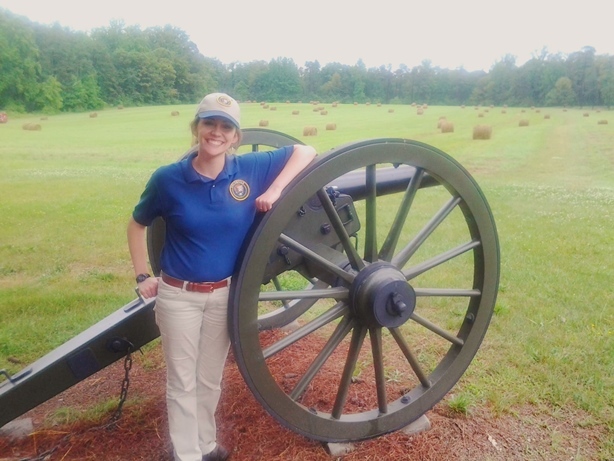 For the past two summers, I have been interning for the National Park Service; Fredericksburg and Spotsylvania National Military Park in 2012, and now Richmond National Battlefield Park this summer. Every day, I encounter visitors who come searching for family ties to the battlefield. Whether it be ancestors who fought for Union or Confederate, the search brings peace and purpose to the heart of the Civil War wanderer. The sparkle of excitement from walking the ground of an ancestor never ceases to amaze me, but I never thought I could share in this excitement. My father has always been interested in our family linage. Being an activity he shared with his own father, my Dad collected paper documentation, family records and used Ancestry.com to consolidate his findings with other relatives across the country. When my grandfather died, the hunt for Civil War ancestors dwindled. The lead stopped with a possible soldier from Wisconsin, with nothing further to find. Years went by with no luck until I decided to snoop for myself. Pension filed by Coffeen’s widow, Julia, in 1922 after relocating to Kansas. When my boyfriend set up a free trial on Ancestry.com, we made my family tree just to see what new things we would find. As we watched, it burst into life, lighting up with hints and possible connections to other trees. While investigating my father’s family, he discovered a young man named David Coffeen from Kenosha, Wisconsin. After matching some of my father’s information, David’s story began to become relevant to my life. Enlisting in 1861 in the 5th Wisconsin Infantry, David was a part of the 6th corps of the Army of the Potomac. The 5th fought through most of the major battles in the east. 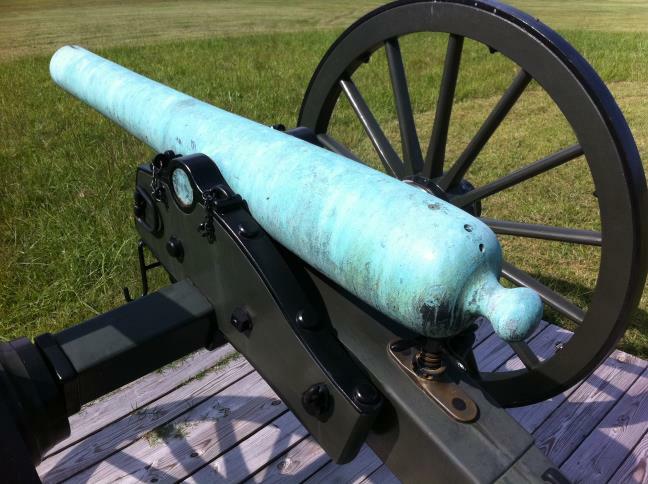 From Chancellorsville to Cold Harbor, the 5th was engaged. 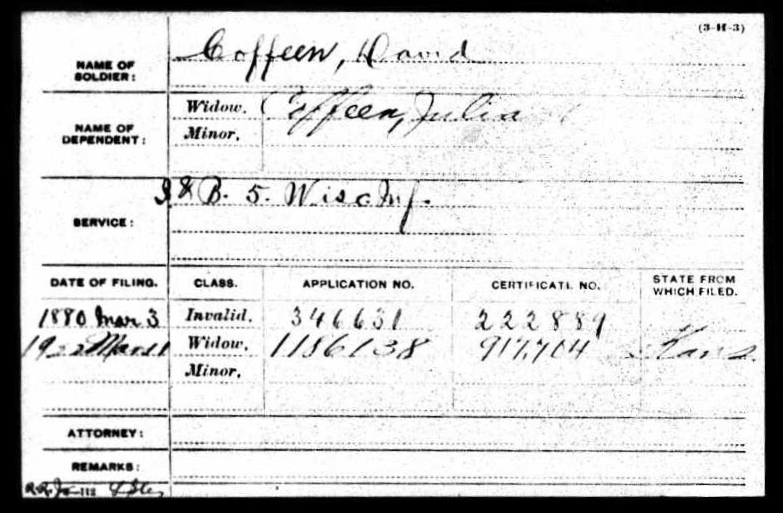 Upon finding his pension record from 1888 and another from his wife after his death in 1922, I suddenly had the excited spark in my own heart become inflamed with the same curiosity as the many visitors I have assisted. I wanted to know more! 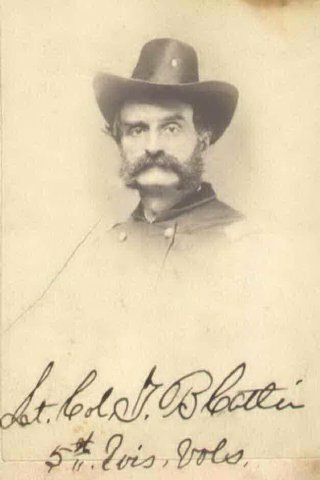 Lt. Col. Theodore Catlin, commanded the 5th Wisconsin Infantry at Cold Harbor. I am fortunate enough to be working with some of the best people in the world, whose knowledge and ability to research is astounding. I contacted Bob Krick, the park historian at Richmond National Battlefields, and with his help we were able to find information on where the 5th was located. Although my direct tie to David Coffeen is still unknown, my tie to the 5th Wisconsin grew deeper as Krick informed me that the unit’s location was on park property. The 5th fought along the road running along the park boundary, and most likely held the earthworks at the end of the tour road. These works can be accessed by the walking trail, which I have walked a few times. Before it was just a recreational activity with a historic twist. Now, it holds a deeper historical significance with a thrill of linage tied in. Where my ancestor fought and dug in is now the land I talk about every single day. What better way to humanize the average soldier by having a figurative face to a name? 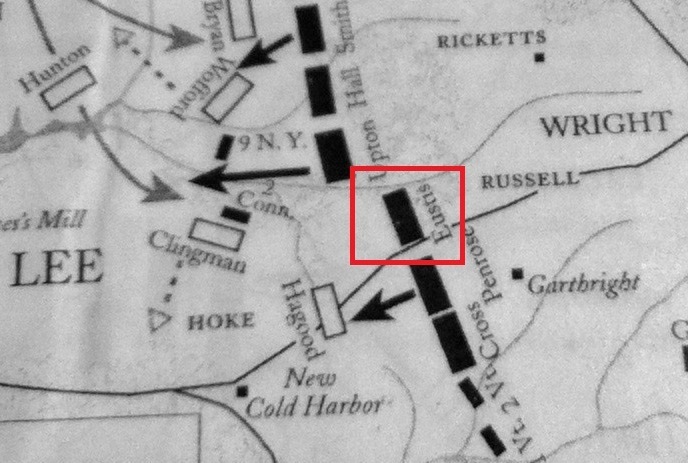 Caffeen’s regiment was in Eustis’s brigade, located within the park’s boundaries. As loose ends of my discovery begin to tie together, I encourage all visitors to investigate their family’s story and explore these amazing battlefields. Not only it is something to do on an average summer day, but seeing and learning about the soil where old family ties meet modern day lives is an experience every American should have. Whether they were fighting for the North or South, they were fighting in a critical time in our past. Bring the past alive, find an ancestor, and visit the ground they fought on. Emma Murphy is a Junior at Gettysburg College from New Lenox, Illinois. She is a Civil War Institute and Brian C. Pohanka Fellow. This summer will be her second summer interning with the National Park Service.